There have been a few occasions when I open a mailing box and my first thought is “gross”. This was one of those times. 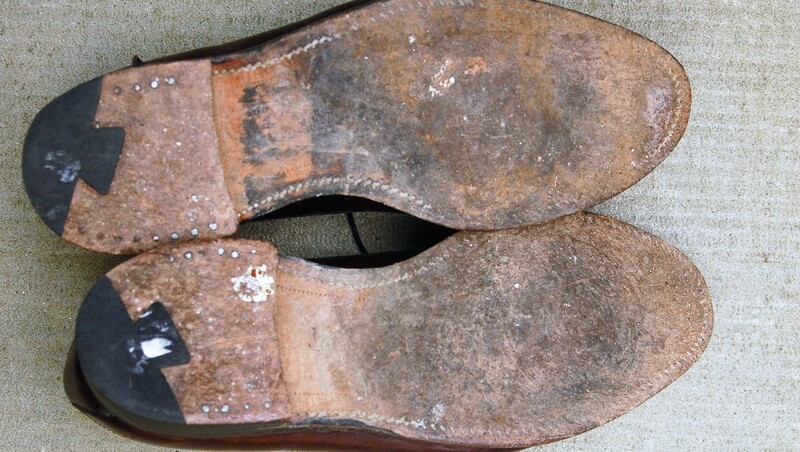 These were the state of the shoes when I received them. Sometimes underneath the dirt and grim is a good pair of shoes. And sometimes not. But in this case, the shoes were solid. 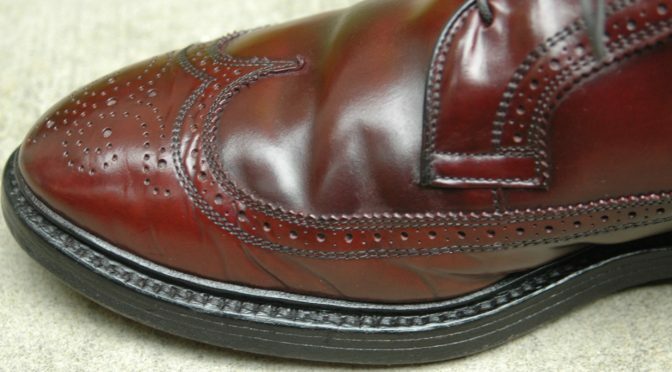 There were though some odd wrinkles in the Shell Cordovan on the inside of the right shoe. Hmm. I didn’t understand why the seller didn’t even bother to wipe off the shoes before packing them. I mean, yuck. 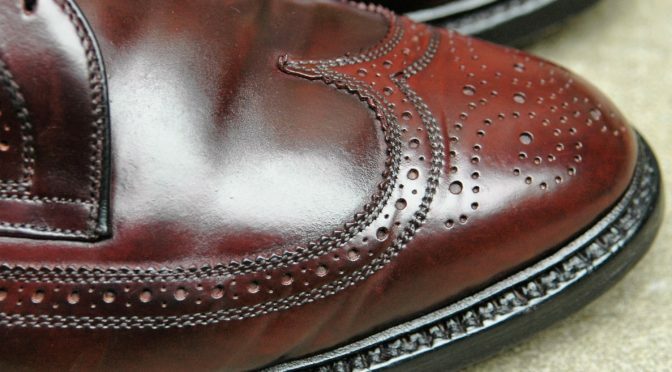 This was an injustice to fine Shell Cordovan shoes. Maybe Trump can fix this too – Make America’s shoes great again. Sellers too. I thought about using Allen Edmonds excellent recrafting service for this pair like I did for a previous pair of black Shell Cordovan MacNails but decided against it. I would fix this pair myself as best I could. 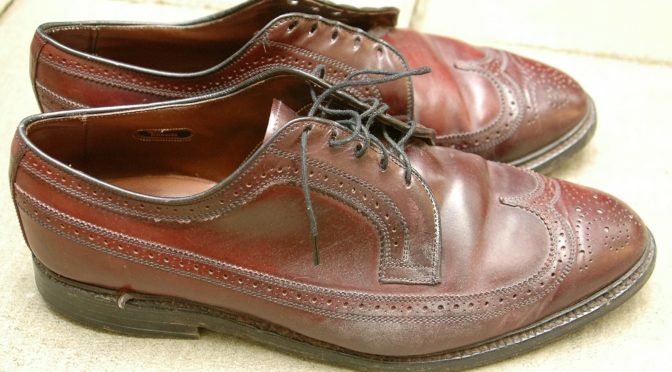 I started cleaning up the shoes with a wipe with a slightly damp cloth and a good brushing. This moved the shoes past the gross phase. I probably spent 20 minutes just brushing the welt because of the layers of dust there. There was some wax build up and I stripped that with Saphir Reno’Mat. Reno’Mat is one of the few products I use that makes me glad I have already reproduced. Only use it outside. The inside of the shoes were in good shape but I still cleaned them with Isopropyl alcohol. It looked like the previous owner picnic’d at the La Brea Tar Pits based on the sole condition. I did a couple rounds with Lexol Leather Cleaner with them. 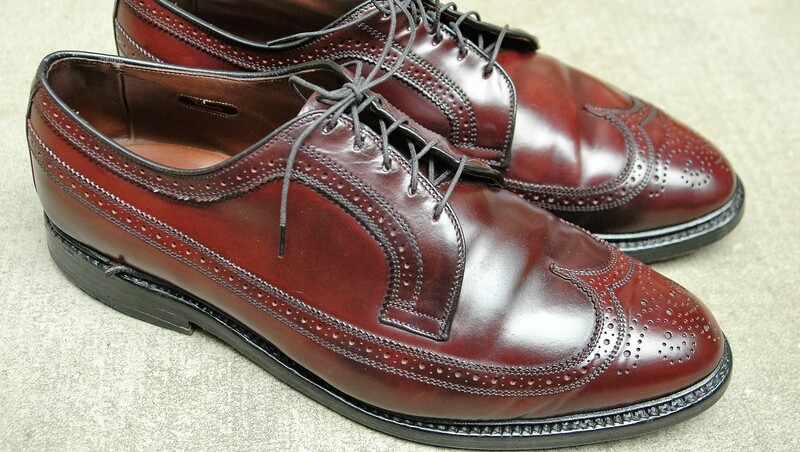 Once clean enough, I edged the shoes with Lincoln Sole and Heel Edge. 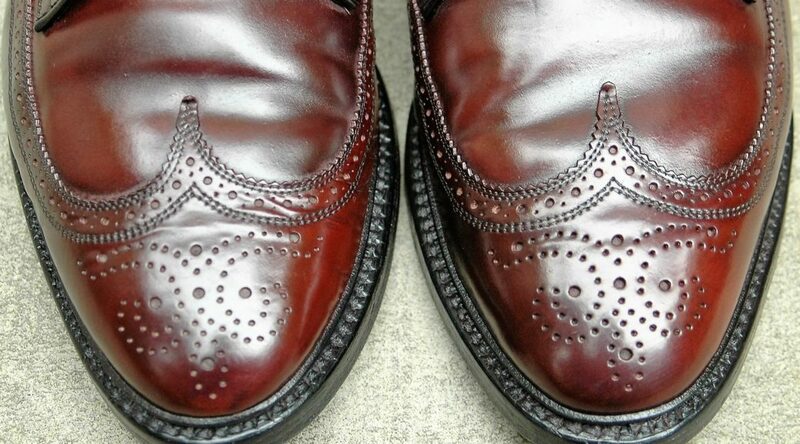 I conditioned the shoes with Venetian Shoe Cream. I also worked the creased area a bit with the back of spoon. That helped ease some of the creases. VSC gives Shell Cordovan a good shine but I also used a tiny amount of Alden Cordovan Wax to provide them a bit more shine. 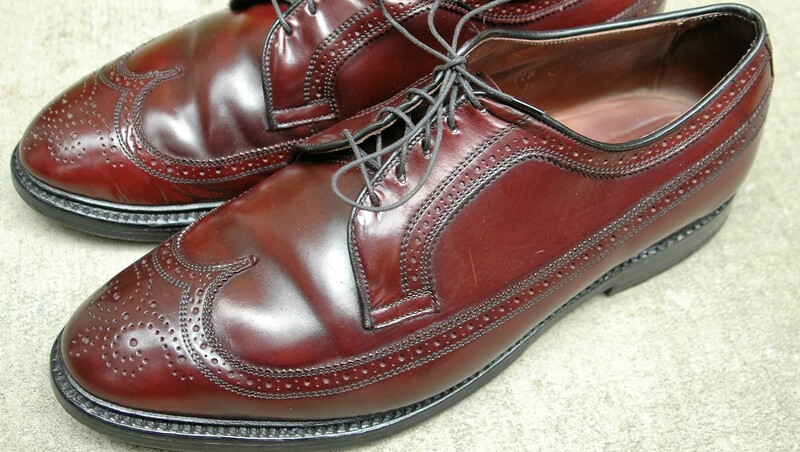 I finished them off with a new pair of Allen Edmonds laces. In the end, the shoes looked much better. Good enough to make their next owner happy. I sold them the following week on eBay. Great job bringing these shoes back to life. They look amazing. Thanks for the tips! 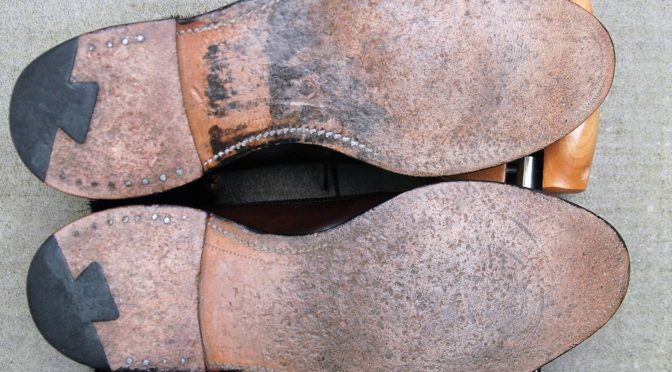 Hi David, may I know how do you differentiate leather quality (corrected grain and full grain leather) when shopping/thrifting? 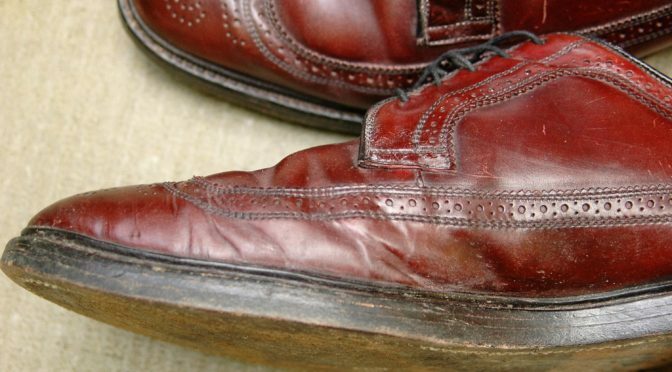 Perhaps by the severity of wrinkle on the leather? Thanks in advance. Smooth corrected grain is easy to spot if the shoe is worn. It usually has a high glossy shine with significant micro creasing. New CG is sometimes tough to distinguish. 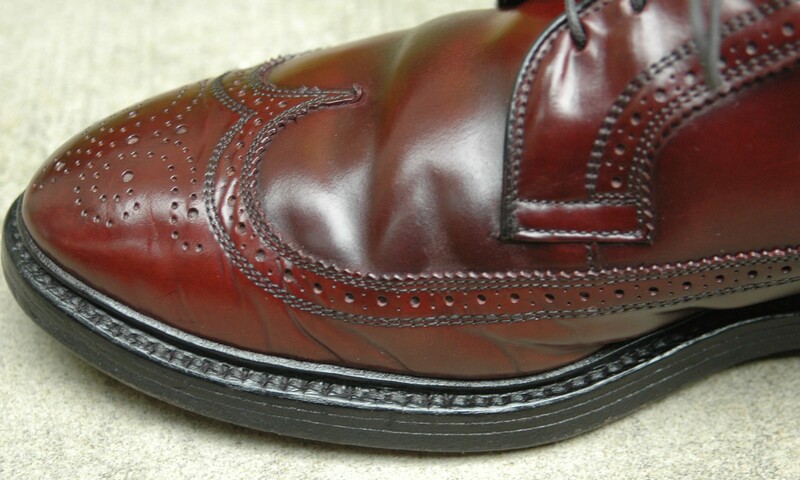 The corrected grain leather from top shoe manufacturers tends to be fairly good and will wear well.